British Open Travel packages include lodging in the area, daily meals, tee times at top courses, and match day transfers. The British Open, also called "The Open", is the oldest of the four major championships in professional golf. Out of the major championships, it is the only one held outside the United States. The British Open is played during the third weekend of July, and is the third major played annually. The Open is played at one of nine courses in the United Kingdom. Royal Portrush Golf Club will play host to the 148th British Open. Royal Portrush Golf Club last hosted The Open Championship in 1951, which was won by Max Faulkner. Numerous golf legends have teed off on its grounds. Past winners at Royal Portrush include Irish Open victors Jamie Donaldson (2012) and Harry Bradshaw (1947). The most recent winner of The Open Championship was Jordan Spieth who won the 2017 tournament at Royal Birkdale. With its rich history beginning in 1860, it has evolved quite a bit since then. Its payout for the winner was originally nothing in the first year of the tournament. In 1863, the purse increased to about $50 dollars for the winner. Today its payout is around $2 million for the winner, and has the largest payout of any major tournament. The most prestigious prize of all is the Claret Jug and the Challenge Belt. The Claret Jug is the famed trophy of the open where the victors name is engraved during the tournament; this led to the famous incident where golfer Jean Van de Velde’s name was engraved prematurely in 1989. The ultimate winner of the 1989 Open was Mark Calcavecchia who stole the title away from Van de Velde, causing a stir in the Claret Jug engraving process. The Challenge Belt is known for its red Moroccan leather and silver buckle, making it distinguishable from your typical accessory. The item was awarded at the first British Open instead of prize money. The belt itself cost only 25 British Pounds in 1860, but today is roughly $2,200 US Dollars. The tournament is known for its breathtaking courses, as The Open is played at some of the most spectacular courses in the world. Additional courses The Open is held at include Royal Liverpool, Carnoustie, Royal Cinque Ports, Turnberry, Prestwick, and many others that span the countryside. St. Andrews has hosted The Open 29 times, followed by Prestwick Golf Club that has hosted 24 tournaments, finally Muirfield has hosted 16. 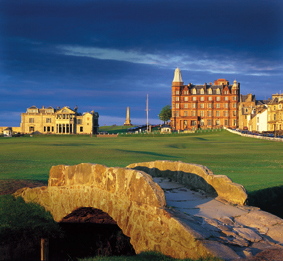 Sports Traveler has British Open Travel Packages and Trips available! Tours packages can include hotel lodging, event transfers, tee times at local courses, plus VIP options. Book your British Open travel package today! Sports Traveler, LLC is NOT an official box office for the British Open. We are NOT affiliated with the Open Tournament nor the Royal Portrush Golf Club. Sports Traveler is an independent travel provider that specializes in making travel arrangements to sold out sporting events world-wide. Any use of trademarked terms on any pages of our website is used solely for descriptive purposes.